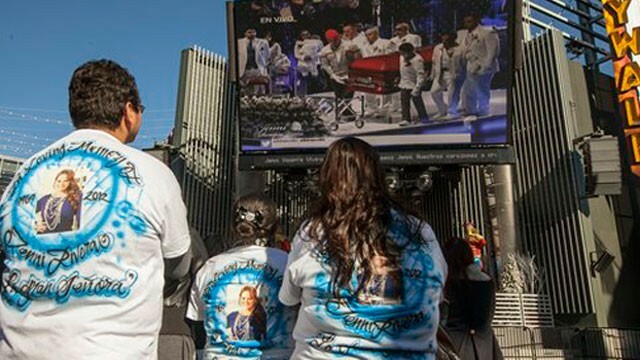 The Rivera family sent an email to members of the press earlier this week describing the ceremony as a “celestial graduation,” and, in lieu of flowers, asked that people donate to the Jenni Rivera Love Foundation, which helps victims of domestic violence. Friends Olga Tañon and Ana Gabriel took the stage to honor Rivera by singing “Mirame” and “Paloma Negra,” respectively, backed by La Banda Divina, who played throughout the ceremony. Actress Kate Del Castillo, Rivera’s Filly Brown co-stars Edward James Olmos and Lou Diamond Phillips, Marco Antonio Solis, El Gordo y la Flaca co-host Raul de Molina, were also present in the audience, among all the fans. The family has informed the media that Rivera’s funeral will be a private event. She will be laid to rest at All Souls Cemetery in her home city of Long Beach.